NRR 30 noise rating for use with high caliber weapons and industrial noise environments up to 115 dB. Generously padded headband and pro-form leather ear seals are comfortable enough for all day wear on the job or on the range. Semi-folding design makes Ultra Pro ear muffs easy to store or carry. 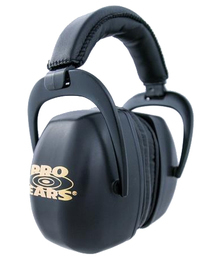 Pro-Ears Ultra Pro Premium Ear Muffs feature a high NRR rating (NRR 30) suitable for protection while shooting large caliber rifles and handguns as well as protection from industrial noise up to 115 dB! The Pro-Form Leather ear seals and generously padded headband make Pro-Ears Ultra Pro ear muffs comfortable to wear for extended periods. Pro-Ears Ultra Pro ear muffs cost more than ordinary ear muffs, but once you put them on, you will know why they are worth the little extra they cost. Replacement ear pads are available to keep your Pro-Ears Ultra Pro ear muffs in perfect conditions for years of comfortable safety in the noisiest environments. Pro-Ears Ultra Pro Premium Headband Ear Muffs (NRR 30)5GlenMarch 6, 2019I've been getting more into target shooting lately and noticed that some of the larger- caliber guns people bring to the range were overwhelming my old muffs. Bought these based on the Noise Reduction Ratio rating and the described comfort. Direct hit on both counts; the muffs do a great job of lessening the noise from large caliber firearms and they are very comfortable to wear. They're a little wider on the head than my old ones and can look a little dorky, but they work so well that I don't care. Pro-Ears Ultra Pro Premium Headband Ear Muffs (NRR 30)5EdAugust 9, 2015They work very well. I love them. Much nicer than the foam insert earplug I was wearing.